Merch stores, themed cafés, Akihabara, manga museums... there are many things manga and anime fans can do when they visit Japan that they often don't have the chance to do in their home countries. However, there is a chance to take a break from the big stores and cities and venture into Japan's countryside to visit the homes of different characters or follow their footsteps. This usually is called doing an "anime pilgrimage" and some towns really play their role in welcoming the fans by putting up posters, statues, selling things related to the series... here are some that may be less known. 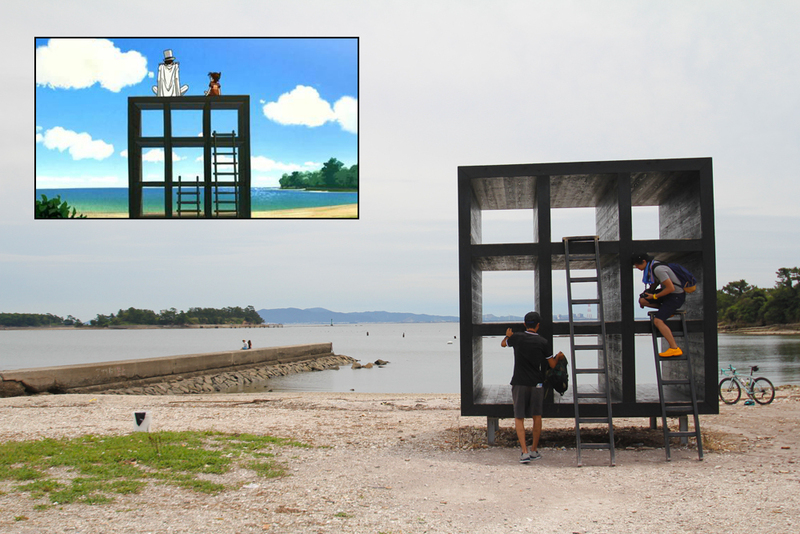 Let's start of with one of the classics, I used to watch Detective Conan as a kid (though I admit I still watch it if I see they're doing it on TV), this spot appears in the movie "Detective Conan: The Lost Ship in the Sky". I discovered this obscure little place when looking through some Aichi travel pdfs, I think you can't really get more off the beaten path than this. In Mikawa Bay, south of Nagoya, there are a few islands scattered about. Sakushima is the one that interests us, one of the many art islands of Japan. There are about 250 people living there, there are no traffic lights or convenience stores, and it's a nice idea to cycle around the whole island collecting stamps from the many different pieces of art if you don't coincide with one of the art events they do during the year. There are a few places on the island that are featured in the movie, however the one above is the most famous one. To get there you can take a ferry from Isshiki Port (一色港) in Nishio City. I was surprised to find out that K-ON! is very popular in Japan, especially since neither the manga or anime are even translated into Spanish. 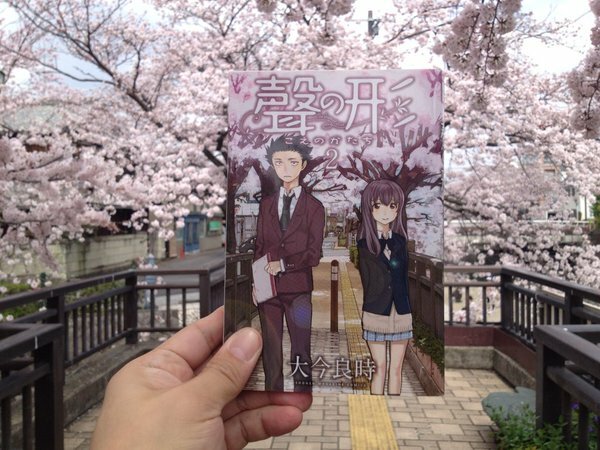 Sakuragaoka High School is the school the girls attend in the series, inspired by this one in real life. 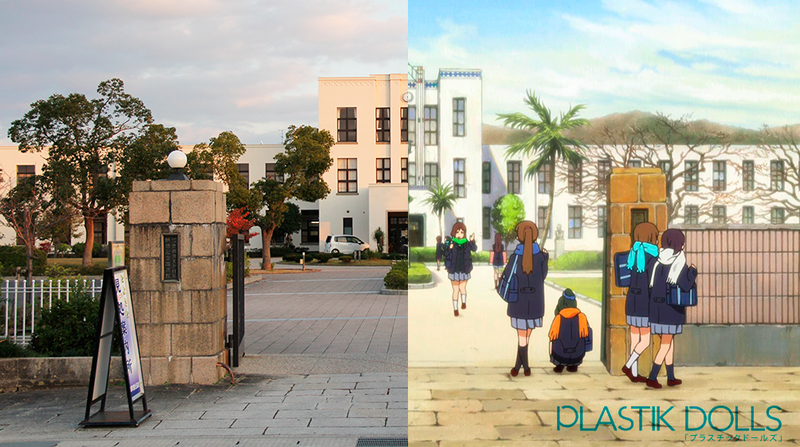 The real version (called Toyosato Elementary School) has no students and is open to the public for K-ON! fans to be able to walk around and go wild taking photos of the hallways and classrooms that are often featured in the series. They've even put some guitars and a table with fake cakes set up as if the characters were there. Maybe you can stop by Osaka or Tokyo first to buy some K-ON! figurine to include in the photos while at the school. Toyosato is a city very near Hikone. 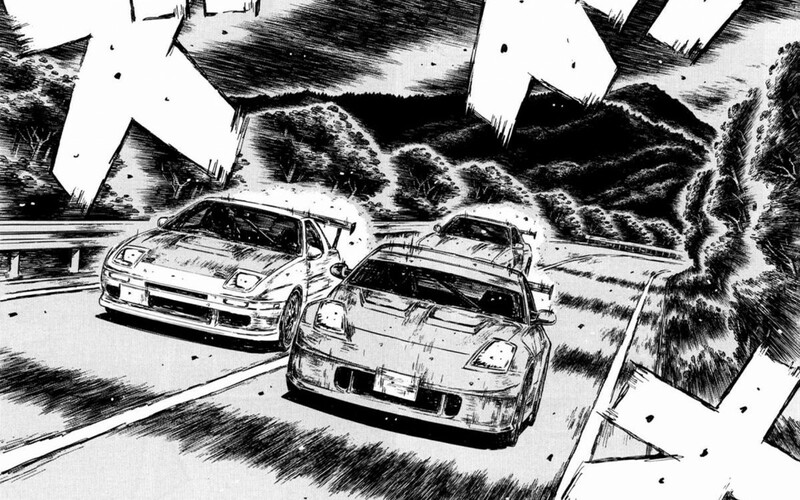 Dubbed as Mt.Akina in the series, Mt.Haruna is the true inspiration for the manga with all of its curves. 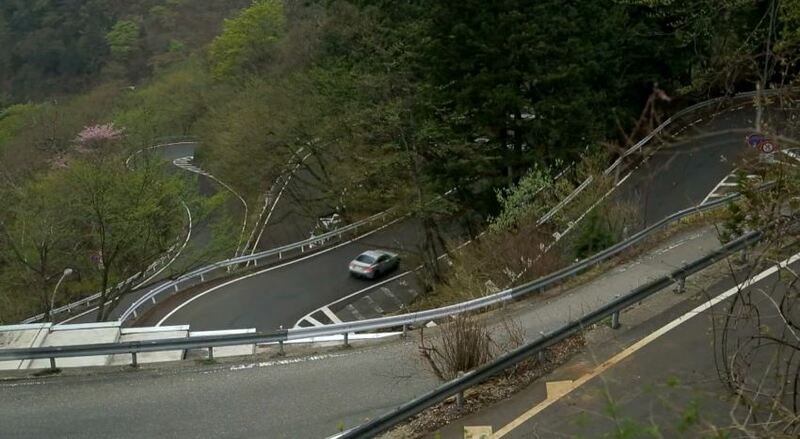 However, this road has become a bit popular with fans of the series so it's best to go early to avoid the crowds, I guess being stuck in a line of cars driving down would interfere a bit with the experience. While you're at it, Haruna Shrine is one of my favourites in Japan and really worth a visit! As with the road from Initial D, Ogaki is a tourist hotspot when the sakura are blooming, all fans gather at this bridge to try to take the beautiful shots that can be seen in the anime/manga. It's best to come early! Though the bridge is the landmark of the series, the city has many other places that make an appearance and can be tracked down. Ogaki's official website has written down the locations to help you find the different spots! Ogaki is also home to Ogaki Castle, this city was the last stop of Matsuo Basho's (a famous haiku poet) trip 'Oku no Hosomichi' and if you're visiting make sure to try out their delicious speciality: mizu mochi! Iwami is a small sleepy fishing city with little in regards to tourism, however ever since the release of series FREE! fans have been showing up to follow the footsteps of their favourite characters. In this case it isn't just one spot to see, but the characters "live there" and many different scenes were inspired from different places all over town. I guess the creators of the series announce what town they got their inspiration from, because I have no idea how anyone would find these places otherwise. The Tourist Information Center now sells FREE! related merch and has maps with the route to follow and places to see. One I've actually been to myself! Just south of Tokyo, Kamakura is a popular day trip with many shrines and temples worth visiting. It also happens to be home to Kouta and Yuka from Elfen Lied. 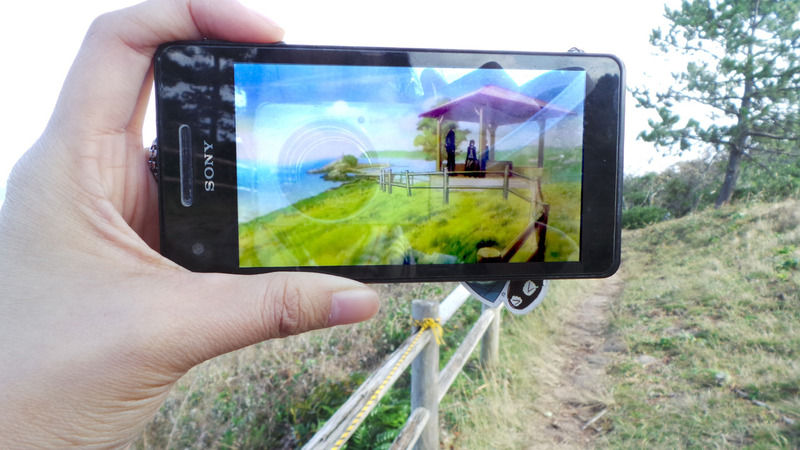 Though their house doesn't exist, the beach, cemetery, streets and just about every other place seen in the anime do. Since Elfen Lied is more on the creepy side and these places tend to be a bit more solitary than the more popular sites of Kamakura, visiting some of these places can be interesting to see the atmosphere. So, what places have you been to that you'd recommend to anime fans? Joey, The Anime Man, tests Chris from Abroad in Japan and Emma from Tokidoki Traveller how much anime they know!